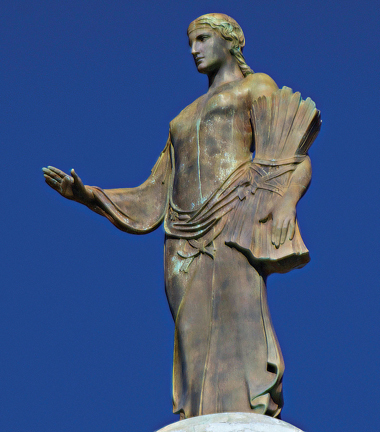 Standing atop the Missouri State Capitol is the historic bronze statue of Ceres, the Roman goddess of agriculture. The statue was installed on Oct. 29, 1924 and has remained there ever since. 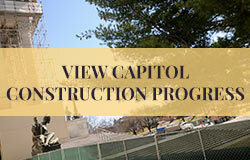 During her installation, a winch was tied to an elm tree and a pulley system was used to hoist her in three pieces to the top of the Capitol dome, where she was installed. Ceres weighs approximately 1,500-2,000 pounds with the heaviest piece weighing 900 pounds. She stands 10 feet, four inches tall. More than a century ago, the Missouri Capitol Commission selected Ceres to stand atop the Capitol to signify the importance of agriculture to the State of Missouri. In her left arm, she holds a bundle of grain. 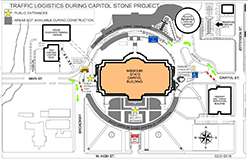 Ceres’ removal from the top of the Capitol dome is scheduled for Thursday, Nov. 15 with a backup date for Friday, Nov. 16 in case weather is not ideal for removal. The public and the press are permitted to view Ceres’ removal outside the designated construction zones. 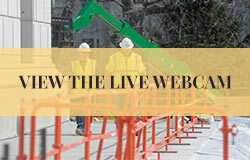 No one other than the construction crew and authorized personnel will be allowed inside the construction zones at any time during the entire project. Drone footage is NOT permitted during the removal of Ceres to ensure the safety of the construction crew, the public, and Ceres. 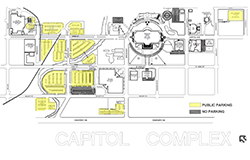 Ceres will be removed by a 550-ton crane stationed on the eastern portion of the south lawn. She will be placed on a flatbed trailer and put on public display for approximately two hours in the media parking lot. No one is permitted to touch her at any time. Ceres will be uncovered when she is removed from the dome. She will remain uncovered during the public viewing event on her removal date. Ceres will be transported to the Conservation of Sculpture and Objects Studio, Inc. for cleaning and conservation, which is scheduled for approximately one year.